The automotive landscape is changing fast. Truck and SUV sales are down almost 30% from last year. Customers are clamoring for anything with a 4-cylnder engine and hybrids are flying off the shelves. Although gas prices have eased a bit as summer comes to a close, consumers seem to have adjusted to the reality of $4 a gallon, leaving car companies scrambling to catch up. Mazda, on the other hand, seems to be ahead of the curve. With an arsenal of small, sporty compacts and not a single V8 in the lineup, the company is well positioned to take advantage of America’s new thirst for efficiency. Mazda even seemed to anticipate this shift by bringing its Euro-market small wagon to America a few years ago and selling it as the MAZDA5. Dubbed “space wagons” in Europe, these compact wagons feature minivan practicality, 4-cylinder efficiency, and in the case of the MAZDA5 , a little extra zoom-zoom. 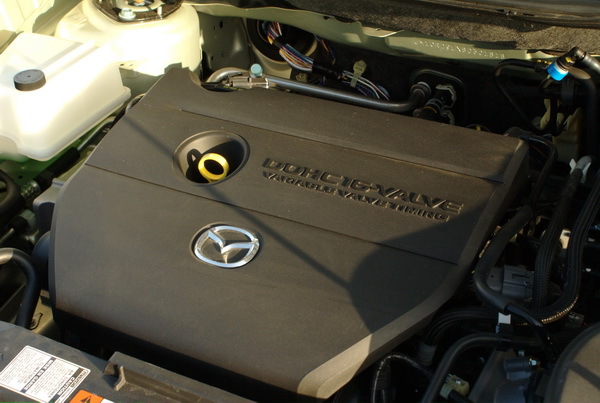 Powering the MAZDA5 is the same 2.3 L 4-cylinder engine that can also be found in the MAZDA3 and MAZDA6. Output is a modest 153 hp and 148 lb ft torque, but unlike many 4-bangers this little engine has a fat powerband, with both good torque at low RPMs and a willingness to rev to the redline. Unfortunately, with over 3,500 lbs to tow around, the engine is easily overwhelmed, especially when driving in the hills. Step on the gas and it takes a leisurely 9.5 seconds to reach 60 mph, evidence that an additional 20 to 30 ponies wouldn’t hurt. Our Touring edition test car came with an optional 5-speed automatic transmission with overdrive, which does a decent job of keeping the engine in the right gear. Take her into the mountains and things get a bit harried, with the transmission jumping between gears a lot to find an illusive sweet spot. Fortunately there is a manual shift option that allows you to hold the car in gear. Like other Mazdas, where the MAZDA5 really shines is in the handling department. Despite looking like a somewhat tall, boxy wagon, the MAZDA5 sits low to the ground and drives like the sporty compact that its chassis is based on. Suspension tuning is outstanding, with a nice balance between handling and comfort. There is some body roll, but hang on to the wheel and you are rewarded with a surprising amount of cornering grip. Credit must also go to the low-profile Toyo Proxes all season tires, which provide sure footing without any noticeable drop in ride quality. Build quality on the MAZDA5 is a notch lower than the best, even at the entry-level end of the spectrum. Some of the knobs and switches feel flimsy to the touch, and there is some unevenness in the exterior body panel gaps. Yet, cruising on the freeway produced nary a creek or rattle and road noise is pleasantly low. Safety features include a full complement of air bags, including side-impact air curtains, and anti-lock brakes with electronic brake assistance, but neither traction or stability control is available. 2010 Cadillac SRX Review – Not exactly your Grand Daddy&#039;s Caddy..